Together, the team relied on gravity measurements of the protoplanet, which the Dawn probe has been collecting since it established orbit around Ceres. Using the Deep Space Network to track small changes in the spacecraft’s orbit, Ermakov and his colleagues were able to conduct shape and gravity data measurements of Ceres to determine the internal structure and composition. What they found was that Ceres shows signs of being geologically active; if not today, than certainly in the recent past. This is indicated by the presence of three craters – Occator, Kerwan and Yalode – and Ceres’ single tall mountain, Ahuna Mons. All of these are associated with “gravity anomalies”, which refers to discrepancies between the way scientists have modeled Ceres’ gravity and what Dawn observed in these four locations. Bland’s study, which was published in Nature Geoscience back in 2016, indicated that ice is not likely to be the dominant component of Ceres strong crust, on a count of it being too soft. Naturally, this raises the question of how the crust could be light as ice in terms of density, but also much stronger. 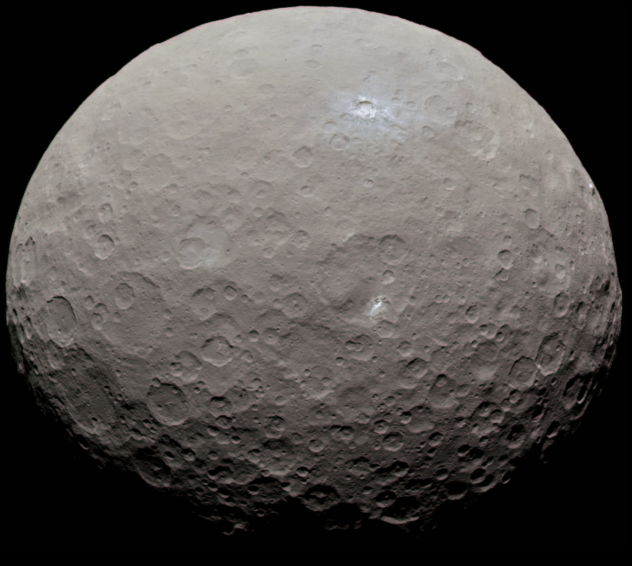 To answer this, the second team attempted to model how Ceres’ surface evolved over time. This high-strength crust, they theorize, could rest on a softer layer that contains some liquid. This would have allowed Ceres’ topography to deform over time, smoothing down features that were once more pronounced. It would also account for its possible ancient ocean, which would have frozen and become bound up with the crust. Nevertheless, some of its water would still exist in a liquid state underneath the surface. During this period and long after, the spacecraft is likely to remain in a stable orbit around Ceres, where it will continue to send back information on this protoplanet/large asteroid. What it teaches us will also go a long way towards informing our understanding of the early Solar System and how it evolved over the past few billion years. Sometimes they see it, sometimes they don’t. That’s why scientists have never been completely sure if Ceres has an atmosphere or not. But now data from the Dawn spacecraft — in orbit of Ceres — confirms the dwarf planet really does have a very weak atmosphere, but it comes and goes. The on-again-off-again nature of Ceres’ atmosphere appears to be linked to solar activity. When energetic particles from the Sun hit exposed ice within the craters on Ceres, the ice can sublimate and create an “exosphere” that lasts for a week or so. Michaela Villarreal from UCLA, lead author of the new study, and her team wrote in their paper that the “atmosphere appeared shortly after the passage of a large enhancement in the local flux of high-energy solar protons,” and explained that when energetic particles from the Sun hit exposed ice and ice near the surface of the dwarf planet, it transfers energy to the water molecules as they collide. This frees the water molecules from the ground, allowing them to escape and create a tenuous atmosphere. A process like this could also be taking place on the Moon, and is likely similar to the process similar to what takes place on comets. There have been hints of an atmosphere at Ceres since the early 1990’s. In 1991, the International Ultraviolet Explorer satellite detected hydroxyl emission from Ceres, but not in 1990. Then, in 2007, the European Southern Observatory’s Very Large Telescope searched for a hydroxide emission, but came up empty. The European Space Agency’s Herschel Space Observatory detected water vapor as a possible weak atmosphere, on three occasions, but did not on a fourth attempt. Dwarf planet Ceres is located in the asteroid belt, between the orbits of Mars and Jupiter. Observations by ESA’s Herschel space observatory between 2011 and 2013 find that the dwarf planet has a thin water-vapour atmosphere. It is the first unambiguous detection of water vapour around an object in the asteroid belt. The inset shows the water absorption signal detected by Herschel on 11 October 2012. 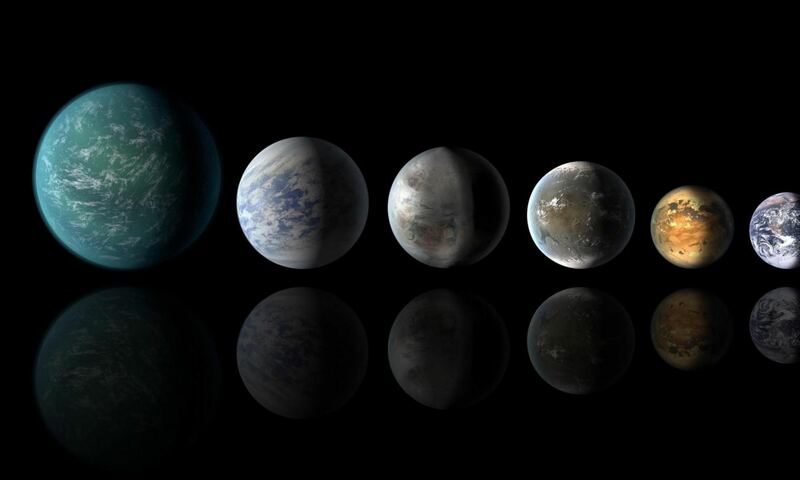 Copyright ESA/ATG medialab/Küppers et al. The Dawn spacecraft itself saw evidence of a transient atmosphere when it arrived at Ceres in March 2015, with data from its Gamma Ray and Neutron Detector instrument. It also has found ample evidence for water in the form of ice, found just underground at higher latitudes, where temperatures are lower. Ice has been detected directly at the small bright crater called Oxo and in at least one of the craters that are persistently in shadow in the northern hemisphere. Other research has suggested that persistently shadowed craters are likely to harbor ice. Additionally, the shapes of craters and other features are consistent with significant water-ice content in the crust. The team’s research shows the atmosphere doesn’t necessarily show up when Ceres is close to the Sun or when sunlight hits the ice directly, but from energetic particles released by the Sun when its activity level is high. For example, the best detections of Ceres’ atmosphere did not occur at its closest approach to the Sun. Also, the times where no atmosphere was detected coincided with lower solar activity, so the researchers say this suggests that solar activity, rather than Ceres’ proximity to the Sun, is a more important factor in generating an exosphere. Ceres actually is now getting closer to the Sun. However, since the Sun appears to be in a very quiet period, Villarreal, Russell and team predict an atmosphere won’t show up, that the dwarf planet will have little to no atmosphere for some time. However, they said both Dawn and other observatories should keep an eye on what’s happening at Ceres. The bright regions on the dwarf planet Ceres have been some of the most talked about features in planetary science in recent years. While data from the Dawn spacecraft has shown these bright areas are salt deposits (alas, not lights of an alien city), the question remained of how these salts reached the surface. Researchers with the Dawn mission say they have now thoroughly investigated the complex geological structures in Occator crater, the region with the brightest regions on Ceres. The scientists conclude that a bright dome-like feature called Cerealia Facula is the remnant of a cryovolcano — an ice volcano — that repeatedly and relatively recently spewed salty ice from within Ceres up to the surface. Occator crater located in the northern hemisphere of Ceres measures 92 kilometers (57 miles) in diameter. In its center is a pit with a diameter of about 11 kilometers (7 miles). On some parts of its edges, jagged mountains and steep slopes rise up to 750 meters (820 yards) high. Within the pit a bright dome formed. It has a diameter of 3 km (1.8 miles), is 400 meters (437 yards) high, with prominent fractures. In analyzing images from Dawn’s Framing Camera, Nathues and his team deduced that the central pit is a remnant of a former central mountain, formed from the impact that created Occator Crater about 34 million years ago. But with a method for estimating the age of a planet’s surface – called crater counting — the science team could determine the dome of bright material is only about four million years old. This suggests, the team said, that Occator crater has been the scene of eruptive outbursts of subsurface brine over a long period and until almost recently. Jupiter’s moons Callisto and Ganymede show similar types of domes, and researchers interpret them as signs of cryovolcanism. While Ceres is too far from the Sun to be warm enough for regular volcanic activity, it very likely has harbored cryovolcanic activity, and it may even be active today. Images from the Hubble Space Telescope taken more than a decade ago hinted at the bright spots in Occator Crater, but as the Dawn spacecraft approached Ceres in 2015, new images showed the bright areas almost shining like “cosmic beacons, like interplanetary lighthouses drawing us forth,” as described by Marc Rayman, the chief engineer and mission director for Dawn, in an interview with me last year. Dawn scientist had previously determined the bright areas were salts left over from subsurface briny water that had made its way to the surface, and in the vacuum of space, the water sublimated away, leaving behind the dissolved salts. These salts were determined to be sodium carbonate and ammonium chloride. It is currently unknown if the region in Occator Crater is active, but there are hints it is, at least at a low level. In 2014 the Herschel spacecraft detected water vapor above Occator, and images from Dawn’s cameras of the crater show a ‘haze’ when imaged at certain angles, and this has been explained as the sublimation of water. Dawn scientists are also studying the large volcanic feature on Ceres, Ahuna Mons, to determine if it could be a cryovolcano, and will continue to study other bright areas on Ceres, as well.